After a friend showed me the Friedchillies video titled, Best Burger in Town, it made me so excited about this place, I practically went down there and dragged sayang together with me the very next day. Gian already ma ! 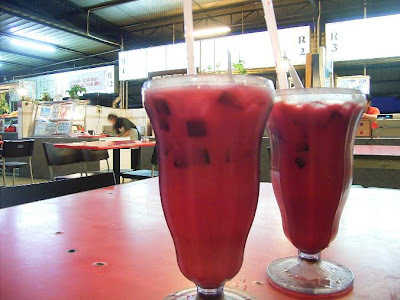 This place is located at the Medan Selara @ TTDI, Jln Burhanuddin Helmi. Opposite one of my more favoured place, Penang Mali. It wasn't very crowded for a Medan Selera , which started me on my suspicions. Why this place not crowded ? Anyways we got ourselves seated, and shortly after, a waitress came by and put a two page spread menu infront of us and went off to attend to her chores. Sayang ordered her Chicken Burger, I ordered a Double Cheese Burger. I remembered that I had ordered the additional Mushroom Sauce, but it didn't come. Look here is the catch. Have you seen the Friedchillies Video ? 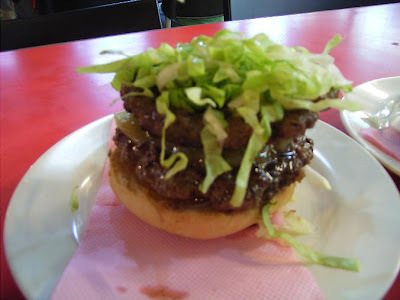 The one that talked about best burger in town ... If you haven't , don't bother. Why ? The burger they shot in the video is definitely different from the burger I ate. 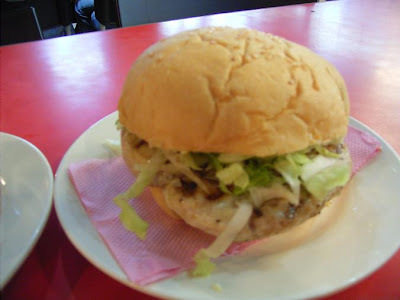 In the video, Azim was shown in a short interview saying, his burger is made simple, cooked simple, and he puts in only the best salads (then he puts in one big piece of perfect Lettuce !) So ? Look at my picture below. Served totally different. Hidden in the lettuce, you could find one small piece of pickle and a slice of tomato. Taste wise ? The burger had no taste in it.... Everything was done wrong. Taste like what ? 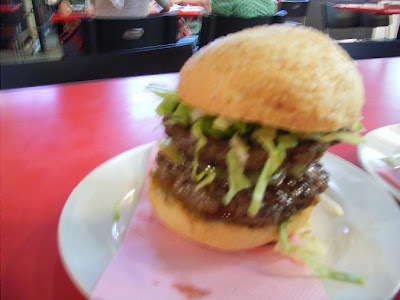 It tasted as if the beef patty was marinated with just Black Pepper and Salt. I mean to say , everything tasted so wrong man. 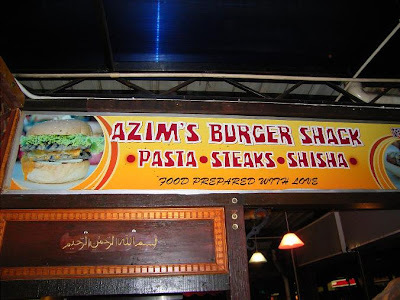 Or was it that day , Azim's burgers were off form, accidentally put too much black pepper ? Lets give the burger joint the benefit of th doubt then. Secondly, there wasn't even any French Fries that came with the burger. The whole serving for a Burger should at least come accompanied by Fries and Salad. Unless you are charging Rm3 like OTAI and RAMLY, I got nothing to say la.... Azim charges an exorbitant RM 12 for that burger. Oh ya and if you want you can add their so called " Special Mushroom Sauce" for RM1(I ordered but didn't come, my loss I suppose !) . My Burger.... Look at the Serving !! If you wanted to get a decent burger, which tastes good and all, try Chilli's and Friday's burgers. For something abit more economical, I'd take a drive down to Burger King , for their Whopper. The street burger stands are OK la, but they are not in the league of Burger King, or Chili's. Anyway my BEST burger in TOWN comes from Chili's and Fridays. Will review them someday soon.